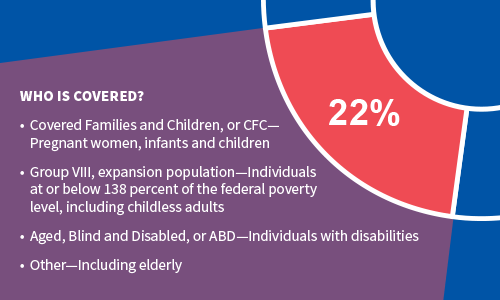 Medicaid and the Children’s Health Insurance Program provide health care coverage for people with disabilities and for low-income Ohioans — families and children, pregnant women and the elderly. Today, one in four Ohioans is enrolled in Medicaid, with 83,000 active providers caring for 3 million individuals. The Medicaid program is jointly funded by states and the federal government. In Ohio, the current Federal Medical Assistance Percentage, or FMAP, for most Medicaid expenditures is 63.02 percent; 85.6 percent for children; and 93 percent for Medicaid expansion. Connect here to view Medicaid-specific Finance News prepared by OHA's Health Economics & Policy team. Medicaid was the payer in 22 percent of Ohio hospital encounters in 2017 reimbursing hospitals 79 cents on the dollar for the cost of caring for Medicaid beneficiaries. Ohio hospitals serving a disproportionate share of poor and disabled Ohioans received $388 million in supplement payments in 2016 though hospitals statewide posted a $2.3 billion loss on Medicaid reimbursements. Ohio expanded Medicaid program eligibility in 2014 to include additional uninsured adults with incomes up to 138 percent of the federal poverty level. In state fiscal year 2017 the expansion group accounted for 23.1 percent of Ohio’s Medicaid enrollment and 22.9 percent of Ohio’s Medicaid expenditures. OHA's Health Economics & Policy team has helped members navigate the Ohio Department of Medicaid's State Innovation Model, or SIM, test of multi-payer, value-based payment models. OHA analysts and member hospitals are providing feedback to the state as it works to transition to value-based alternatives to fee-for-service payments for care. The state has received a federal grant for SIM testing. Ohio's SIM focues on increasing access to patient-centered medical homes and implementing episode-based payments. Read more about the program here.